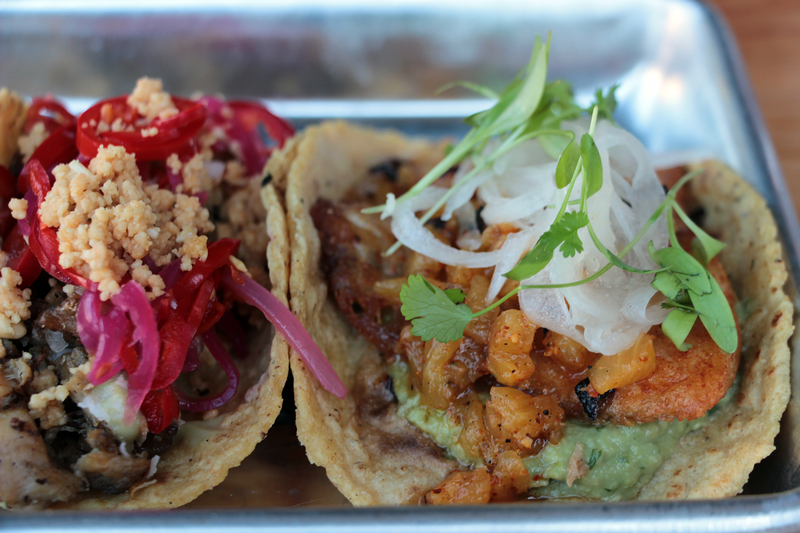 There is a new entry for two of San Francisco’s most competitive dining categories: outdoor patios and tacos. You’ll find it in SoMa at the corner of 4th and Bryant in the former Chavo’s — if you can dodge the backhoes and digging of the never-ending subway tunnel project. 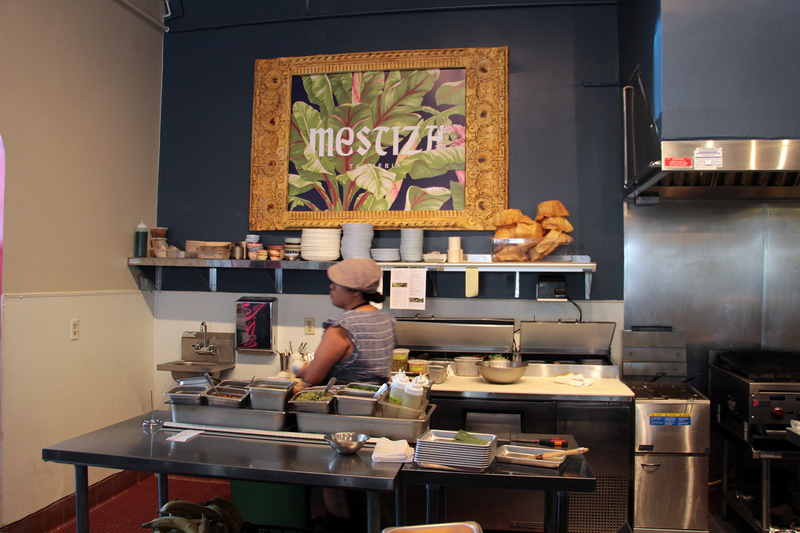 Mestiza is still in its soft opening phase until April 11th. Yet, judging by the lunch rush surge of area start-up workers escaping the office, Mestiza is already hosting a regular audience of hungry, discerning diners. So much for practice time. Dress rehearsal or not, the tacos are clearly already noteworthy at this early stage as the fast casual restaurant has hit the ground running with gusto. 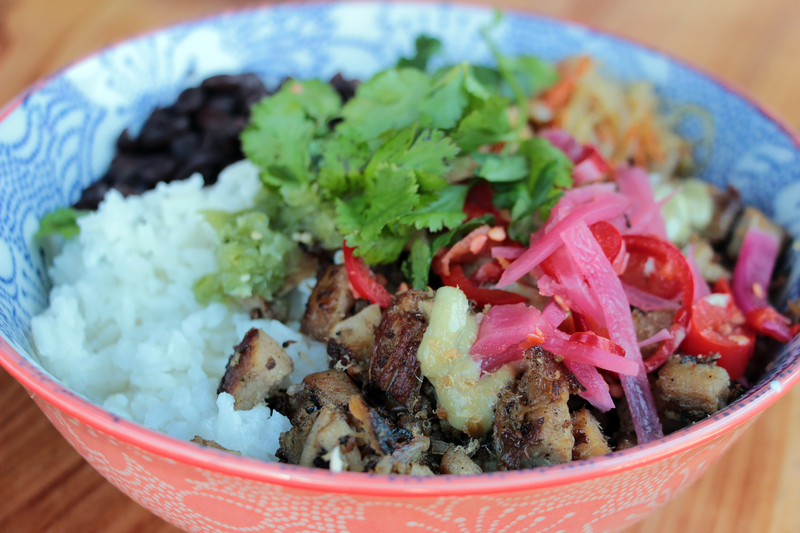 Take the Filipino pork adobo as a perfect example of taking a beloved taco filling staple (carnitas), opening it to an abnormal group of partners (ginger salsa cruda and green papaya) and…watch out. The fork tender meat bursts with moisture, escaping from the tortilla shelter, dripping down your arm after one bite as if someone pushed a “go” button. It’s an electric taco moment. 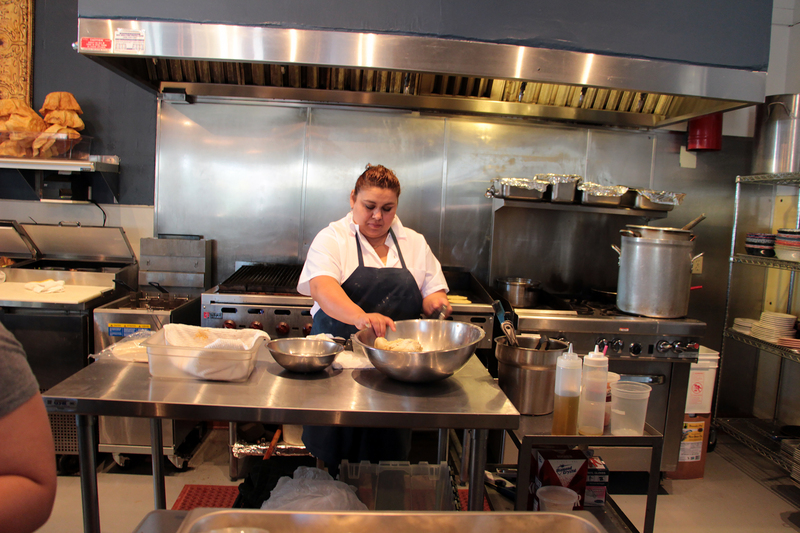 And, it wouldn’t be crazy for Mestiza to serve the pork adobo taco with a bib à la New England lobster feast. 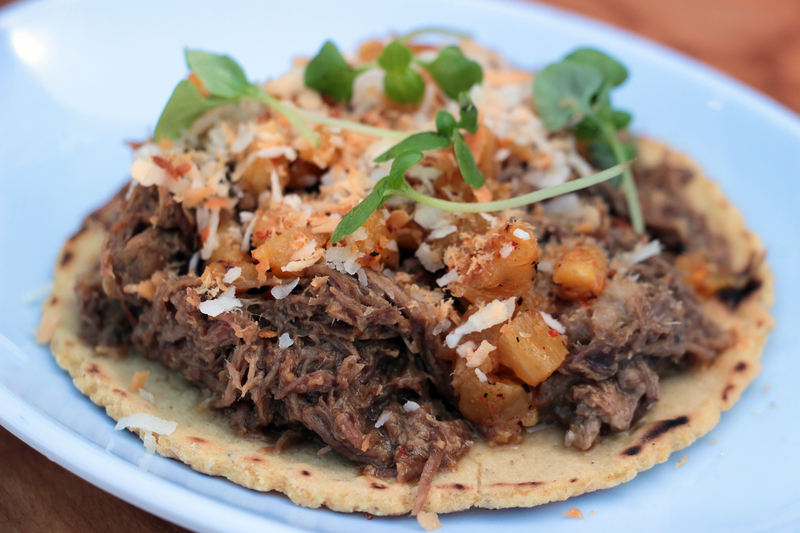 The same can be said for a riveting Thai red curry beef filling brightened by a pineapple arbol chile salsa and coconut flakes. Upon impact, boom, it’s a deliriously messy beef and curry-drenched delight that somehow manages to channel the most robust Thai beef curry into a compact taco package. 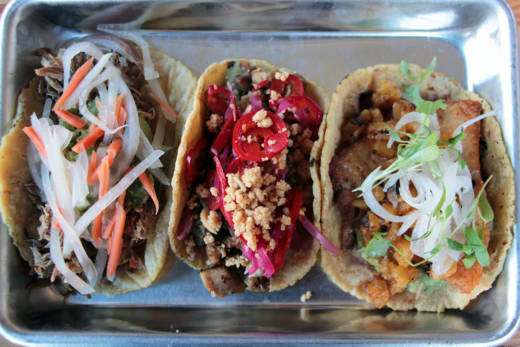 At the end of the day, this is the next level of tacos well beyond the basic carne asada, carnitas, al pastor trio. We’re game to hop on this taco train that is indeed a little more expensive than most versions but exponentially more elaborate. Speaking of al pastor, possibly the most impressive taco filling is cumin and guajillo dusted rock cod that has nothing to do with al pastor flavor-wise other than the pineapple salsa, but, alas, what’s in a name? It’s the rare moist, flaky fish taco that isn’t fried nor slathered in crema. For $1 extra, it’s a very wise investment. Khmer lemongrass chicken bathed in fish sauce sounds like an automatic winner, yet proves to be the one full-on miss. The diced poultry is tough and bland. This is chicken that reminds diners of chicken and why boneless, skinless chicken breast elicits so many eye rolls compared to carnitas or beef. It’s boring. The lemongrass doesn’t come through. That being said, the preparation is saved in taco form because of the abundant red chiles and peanuts garnish that cover up the chicken. 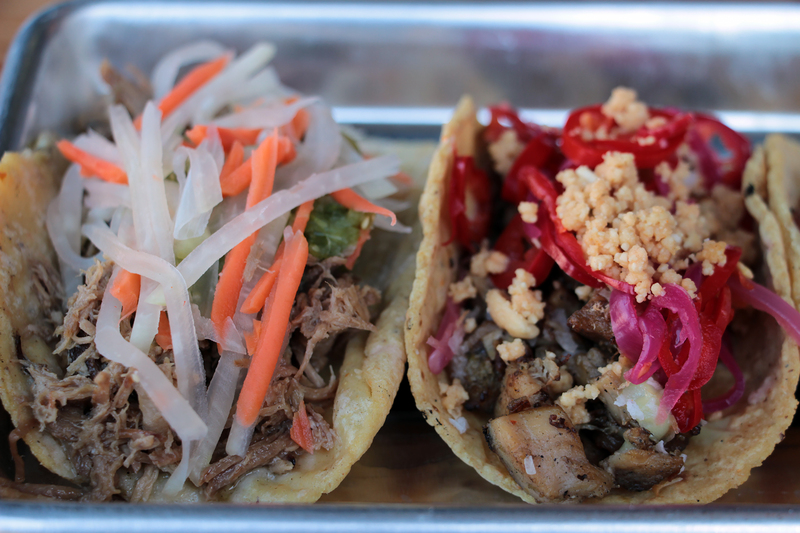 Note to chefs: nuts and tacos are a strong tandem. The menu is customizable like is so fashionable these days. Diners opt between six proteins (mushrooms and eggplants for the vegetarians) in four forms (taco, burrito, taco shell salad and rice and beans bowl. A pair of salads and a pair of raw seafood cocktails make up cold plate starters, while small plates include pork skewers, soy-saturated Filipino pork belly and sweet plantains. 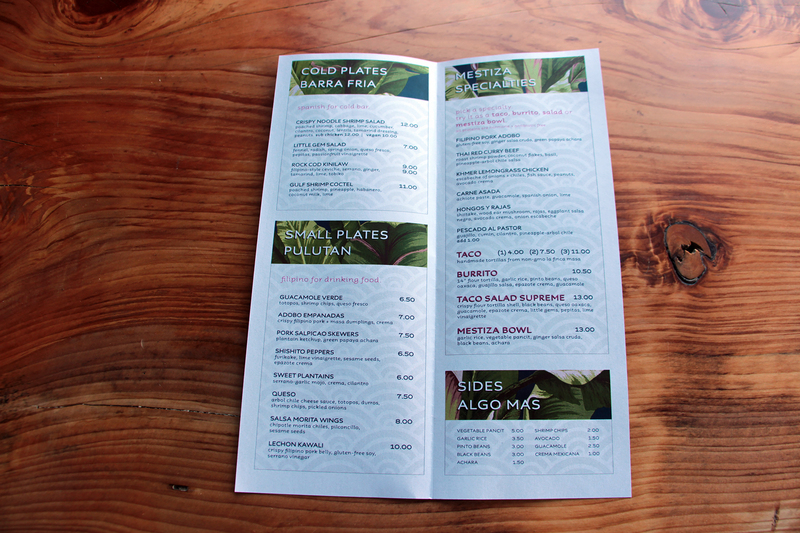 The small plates are called “Palutan,” Filipino for drinking food. Right now alcohol isn’t a main player but hopefully margaritas are in the future cards because the venue screams happy hour loudly. 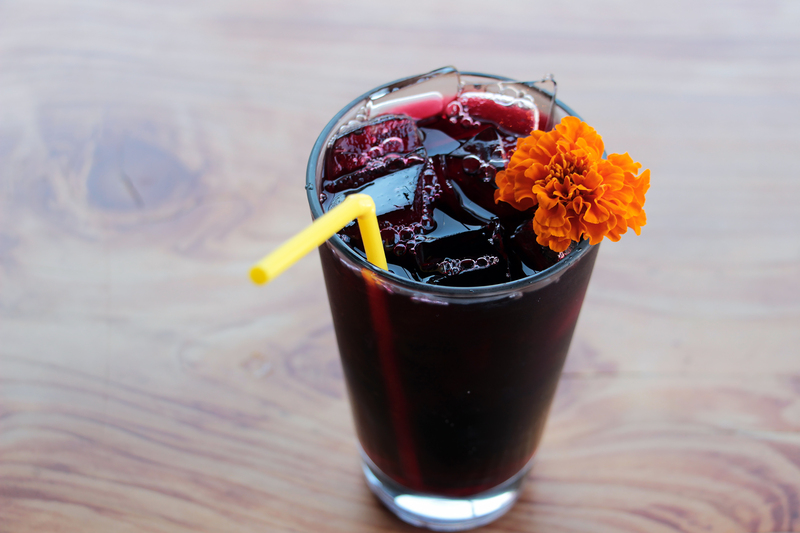 A few beers and wines are offered, along with a hibiscus agua fresca and a mandarin orange agua fresca. Both succeeded in being tart and balanced; not cloyingly sugary. Should you need sugar, dessert awaits with ice cream sandwiches with Mitchell’s Ice Cream or homemade horchata cookies. 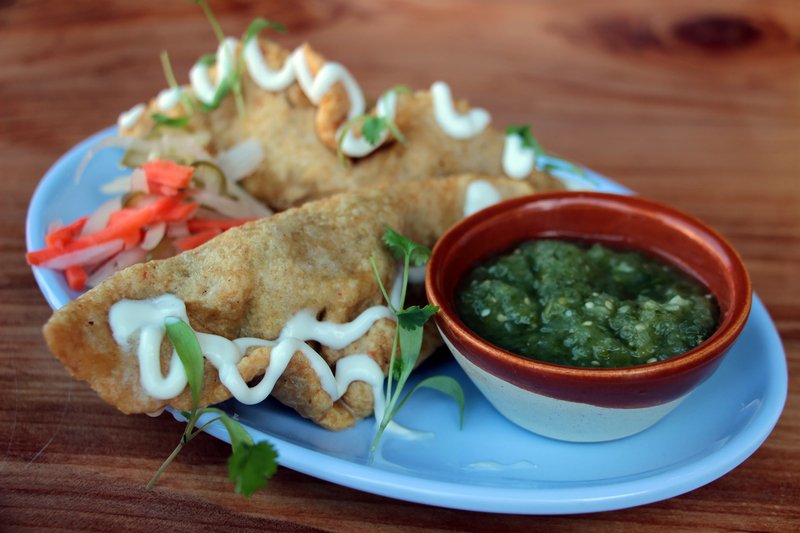 What stands out so early in the game for Mestiza are the details on the plate, like a beautifully spice-nuanced julienned vegetable escabeche with the must-order empanadas with more of that pork adobo in a slick masa wrap that’s like a hybrid tamale-croissant dough. 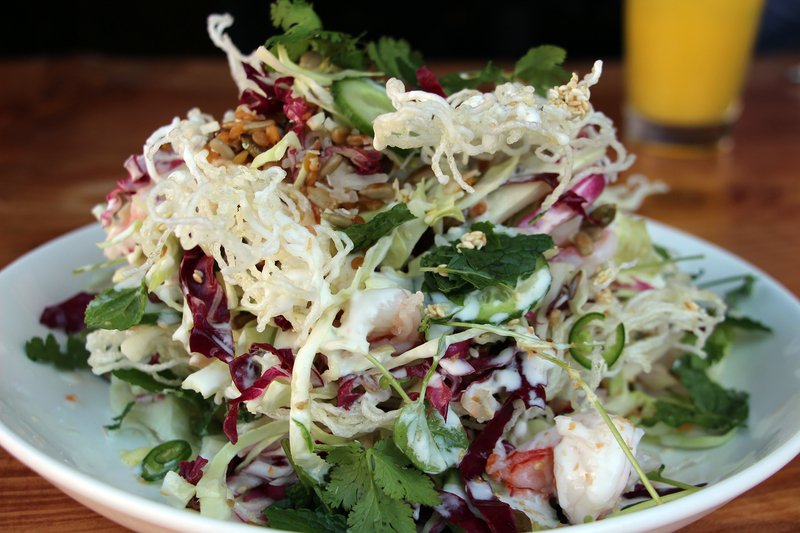 Or, evident in the full-throttle bursts of mint and cilantro that accompany a tangy lime and fish sauce vinaigrette for an under-the-radar shrimp and crispy noodle salad arriving the size of a small car tire. Maybe the greatest details are how the corn tortillas are freshly pressed and made with masa from Oakland’s renowned La Finca Tortilleria (if you’re curious about perfect dense and slightly griddled tortillas with real corn flavor, look no further). 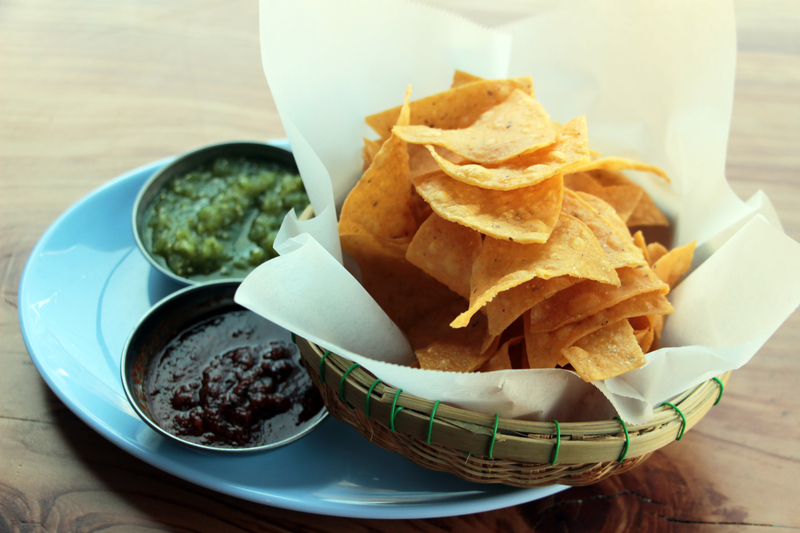 The fresh tortilla chips arriving as you sit with your order number boast just the right crispiness and aren’t distractingly greasy or salty. The partnering tomatillo-based salsa verde and robust guajillo salsa have that right kick and depth they can be universally enjoyed by spice-seekers and the heat-averse. There is clearly a talented chef leading the kitchen. Details aren’t skipped even when the line is ten-deep. Indeed, there is a mighty team running Mestiza. Deanna Sison Foster (Little Skillet, Farmerbrown) is the owner. The Cambodian-born former Chopped Grill Masters winner from TV and chef at Oakland’s Calavera, Sophina Uong, is the chef. Clearly, she’s a talent in real kitchens and reality TV kitchens. So, we mentioned the tacos. Now to that patio. The overall atmosphere evokes the Palm Springs-Austin, Texas desert garden vibe with a slight tropical edge that has become so hip, partly from the recent drought and partly because we all need a Caribbean vacation. Plants dangle from above contrasting with the exposed concrete ceiling, Mission-style arched walls separate the bar and kitchen from the dining area. Seating ranges from beer garden style benches to a pillow-decked banquette with oversize leaves as the design motif. 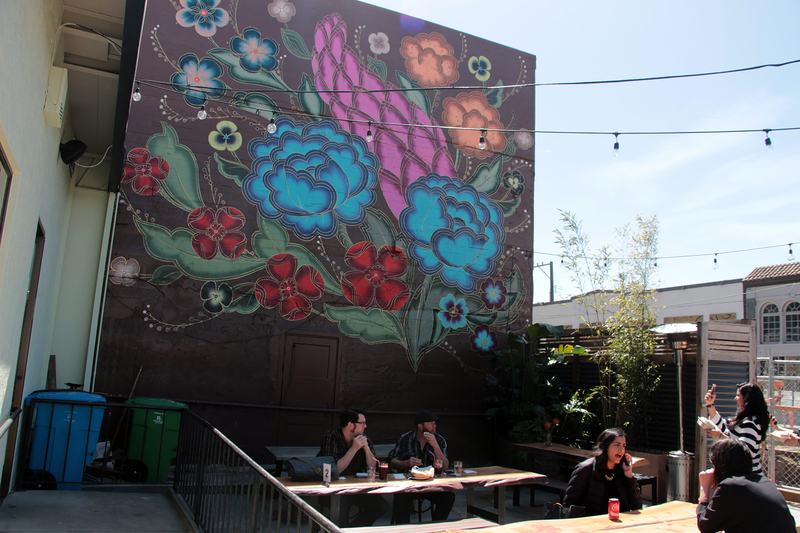 Outside is a striking new floral mural by the artist Jet Martinez, a soon-to-be Instagram magnet. It’s the background for SF’s new go-to patio, complete with a cactus and reclaimed wood tables (speaking of obligatory trends). Inside or outside, everything is breezy and casual, not unlike how all the nearby SoMa start-ups like to operate their offices. The party is rounded out by a soundtrack ranging from blaring Iggy Azalea and CeeLo Green to the deafening jackhammers of the intersection’s construction. Mestiza will no doubt give LA’s perennially hip Salazar a run for its money in this desert good life design genre. It’s all surreal. And fun. Some diners are buried in their phones but most are festive and the servers equally upbeat, yet efficient. They’re quick to notice your table is low on salsa or napkins (a piece of advice: use larger napkins because the small-sized ones mean the table gets littered with them after each bite of taco). One of the social media hashtags for the restaurant, #eatwithoutborders, along with the name’s meaning (mixed cultures or heritage) represent the time and place for Mestiza perfectly. 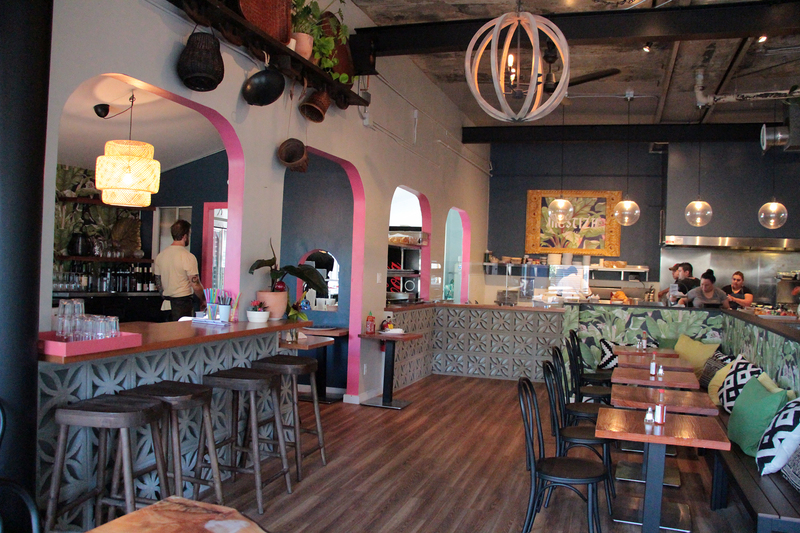 There are obvious political meanings, too, but it really stands for the cuisine of this diverse restaurant, Mexico meets Southeast Asian street food with a little European and South American tossed around, completed within a California context. In brief: world-minded great food. 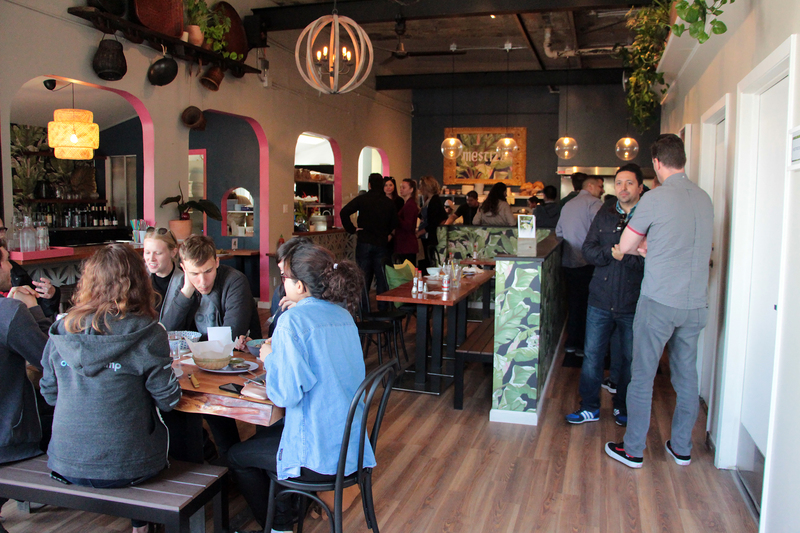 Tacos are clearly on the rise in SF thanks to creative newcomers like Glena’s and Tacorea. 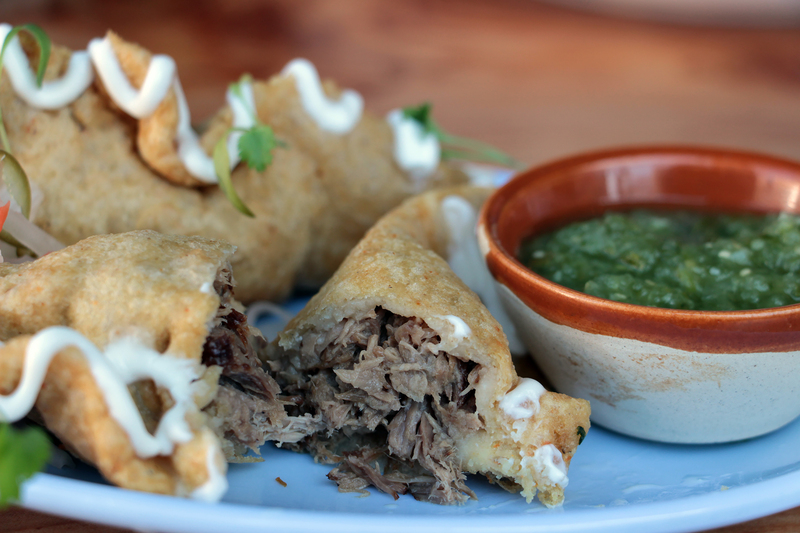 Now top-tier globe-spanning tacos have an ideal SoMa desert hideaway patio to be enjoyed in, a world away from the surrounding Bay Bridge traffic and industrial warehouses. Hours: Currently 11am-2pm but starting April 11, 11am-10pm Mon-Fri. Brunch Sat-Sun 10am-4pm.